Les articles de journaux scientifiques peuvent être lus dans les revues concernées ou téléchargées au format PDF. Une copie personnelle peut se trouver sur ce site. Les droits de reproduction demeurent la propriété de l’éditeur. 2018 – Gannier, A. Present distribution of common dolphin Delphinus delphis in French Mediterranean and adjacent waters as obtained from small boat surveys. Aquatic Conservation: Marine and Freshwater Ecosystems 2018: 1-8. 2018 – Gannier, A. Comparaison de l’habitat estival de quatre cétacés teuthophages préférentiels en Méditerranée nord-occidentale. Rev. Ecol. (Terre Vie) 73(4): 582-602. 2012 – Foraging dives of sperm whales in the northwestern Mediterranean Sea. Gannier A., Petiau E., Dulau V., L. Rendell. Journal of Marine Biological Association of UK 92(8): 1799-1808. 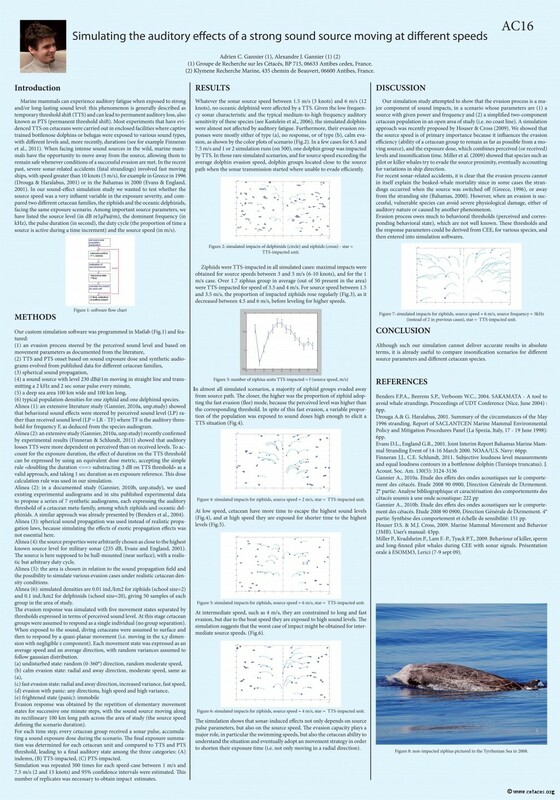 2011 – Using existing data and focused surveys to highlight Cuvier’s beaked whales favourable areas : a case study in the central Tyrrhenian Sea. A.Gannier. Marine Pollution Bulletin 63: 10-17. 2010 – Performance of a contour-based classification method for whistles of Mediterranean delphinids. A.Gannier, S.Fuchs, P.Quèbre, J.N.Oswald. Applied Acoustics 71: 1063-1069. 2010 – Seasonal estimates of densities and predation rates of cetaceans in the Ligurian Sea, northwestern Mediterranean Sea: an initial examination.S.Laran, C.Joiris, A.Gannier, R.Kenney. J. Cet. Res. Manag. 11(1): 31-40. 2009 – Modelling the habitat suitability of cetaceans: Example of the sperm whale in the northwestern Mediterranean Sea. E.Praca, A.Gannier, K.Das, S.Laran. Deep-Sea Research I 56: 648–657. 2008 – Ecological niche of three teuthophageous odontocetes in the northwestern Mediterranean Sea. E.Praca, A.Gannier. Ocean Science 4: 49–59. 2008 – Spatial and temporal prediction of fin whale distribution in the northwestern Mediterranean Sea. S.Laran, A.Gannier. ICES Journal of Marine Science 2008 : 1-10. 2008 – Cuvier’s beaked whale distribution in the Mediterranean Sea: results from small boat surveys 1996-2007. A.Gannier, J.Epinat. Journal of the Marine Biological Association of the U. K. 88(6): 1245–1251. 2007 – SST fronts and the summer sperm whale distribution in the northwest Mediterranean Sea. A.Gannier, E.Praca. Journal of the Marine Biological Association of the U. K. 87(1): 187–193. 2007 – Movements of sperm whale in the western Mediterranean preliminary photo-identification results. V.Drouot-Dulau, A.Gannier. Journal of the Marine Biological Association of the U. K. 87(1): 195–200. 2006 – Summer activity pattern of fin whales (Balaenoptera physalus) in the northwestern Mediterranean Pelagos sanctuary. A.Gannier. Mésogée 61: 35-42. 2006 – Mediterranean fin whales at risk from fatal ship strikes. S.Panigada, G.Pesante, M.Zanardelli, F.Capoulade, A.Gannier, M.T.Weinrich. Marine Pollution Bulletin 52: 1287–1298. 2006 – Summer cetacean population in the Pelagos marine sanctuary (northwest Mediterranean): distribution and abundance. A.Gannier. Mammalia 2006: 17-27. 2005 – Summer distribution and relative abundance of delphinids in the Mediterranean Sea. A.Gannier. Rev. Écol. (Terre Vie) 60: 223-238. 2004 – Summer social distribution of sperm whales (Physeter macrocephalus) in the Mediterranean Sea. V.Drouot, A.Gannier, J.C. Goold. Journal of the Marine Biological Association of the U. K. 84: 675–680. 2004 – Diving and feeding behaviour of sperm whales (Physeter macrocephalus) in the northwestern Mediterranean Sea. V.Drouot, A.Gannier, J.C. Goold. Aquatic Mammals 30(3): 419-426. 2004 – A note on genetic isolation of Mediterranean sperm whales (Physeter macrocephalus) suggested by mitochondrial DNA. V.Drouot, M.Bérubé, A.Gannier, J.C. Goold, R.J. Reid, P.J. Palsbøll. J. Cet. Res. Manag. 6(1): 29-32. 2004 – The relationship between summer aggregation of fin whales and satellite-derived environmental conditions in the northwestern Mediterranean Sea. A.Littaye, A.Gannier, S.Laran, J.P.F. Wilson. Remote Sensing of Environment 90: 44–52. 2002 – Distribution and relative abundance of sperm whales in the Mediterranean Sea. A.Gannier, V.Drouot, J.C. Goold. Marine Ecology Progress Series 243: 281-293. 1999 – Diel variations of the striped dolphin distribution off the French Riviera (Northwestern Mediterranean Sea). A.Gannier. Aquatic Mammals 25 (3): 123-134. 1998 – A contribution to the knowledge of the cetological fauna in the western Sardinia waters. A.Gannier. Hystrix 10(2): 21-28. 2009 – Comparison of odontocete populations of the Marquesas and Society Islands (French Polynesia). A.Gannier. Journal of the Marine Biological Association of the U. K. 89(5): 931–941. 2006 – Environmental variables affecting the residence of spinner dolphins (Stenella longirostris) in a bay of Tahiti (French Polynesia). A.Gannier, E.Pétiau. Aquatic Mammals 32(2): 202-211. 2004 – The large scale distribution of humpback whales (Megaptera novaeangliae) wintering in French Polynesia 1997-2002. A.Gannier. Aquatic Mammals 30(2): 227-236. 2002 – Distribution of Cetaceans off the Marquesas Islands (French Polynesia) as obtained from a small boat dedicated survey. A.Gannier. Aquatic Mammals 28(2): 198-210. 2000 – Preliminary results on the distribution of wintering Humpback Whales (Megaptera novaeangliae) in French Polynesia, 1997-1999. A. Gannier, S. Bourreau & C. Casacci. Report SC/52/IA9 to the 42th annual meeting of the Scientific Committee of the International Whaling Commission (Adelaïde): 17pp. 2014 – Presence-only modelling of eight cetacean species in the Western Mediterranean Sea. A. Gannier. Groupe de Recherche sur les Cétacés, unpublished report: 26pp. 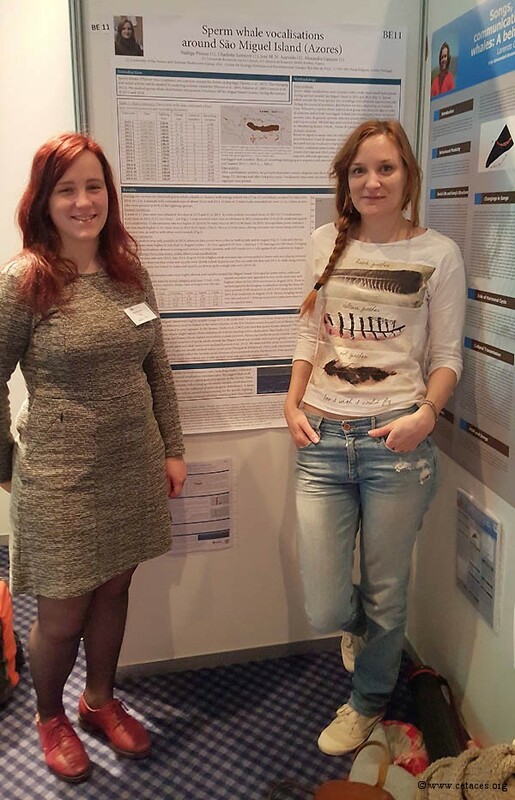 2015 – Simulating MFA sonar effects on a Mediterranean cetacean population. A.J. Gannier , P. de Gallaix & A.C. Gannier. Groupe de Recherche sur les Cétacés, unpublished report: 27pp. 2015 – The seasonal status of sperm whale in the liguro-provençal basin: new results for a better conservation management. A. Gannier. Groupe de Recherche sur les Cétacés, unpublished report: 12pp. 2012 – Simulating the auditory effects of a strong sound source moving at different speeds. 26th Conference of the ECS (Galway, Irlande, 26-28 March 2012). 2004 – Does spring bloom timing and intensity influence fin whale distribution in the Ligurian Sea?